Clay Mills Road Baptist Church Pastor Jeff Fugate claims ignorance was the reason that his assistant dressed up in blackface to participate in a boxing match as part of a skit for the National Young Fundamentalist Conference in Lexington, Ky., reports The Daily Mail. 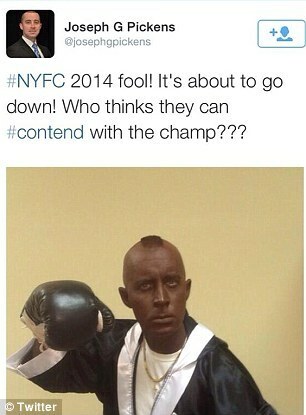 Many spoke out after Joseph G. Pickens, Fugate's assistant, tweeted a picture of himself in blackface wearing boxing gloves with the caption, "#NYFC 2014 fool! It's about to go down! Who thinks they can #contend with the champ???" Fugate only realized the problematic nature of the skit after it was brought to his attention on Twitter, reports the Christian Post. Pickens' tweet was swiftly deleted and his account appears to have been deleted as well. The skit featured a boxing match between a blackfaced Pickens and another man acting as Curly from the Three Stooges, as seen in the video above. The theme of this year's National Young Fundamentalist Conference was the boxing-related "Contend." Fugate highlighted Pickens' inexperience as a way of explaining the performance, revealing that he was a recent Bible college graduate and "not even a pastor." "I don’t know what to say, I didn’t mean to offend anyone… I never had any thought of it until I got a couple of twitter messages," he continued. Fugate told The Daily Mail that a significant portion of his congregation is black, and that he has "absolutely zero racism in [his] heart towards black people."